Last week I wrote about an Adobe Launch extension I built to familiarize myself with the extension development process. This extension can be used to integrate Adobe Analytics and Target in the same way that used to be possible prior to the A4T integration. For the first several years after Omniture acquired Offermatica (and Adobe acquired Omniture), the integration between the 2 products was rather simple but quite powerful. By using a built-in list variable called s.tnt (that did not count against the 3 per report suite available to all Adobe customers), Target would pass a list of all activities and experiences in which a visitor was a participant. This enabled reporting in Analytics that would show the performance of each activity, and allow for deep-dive analysis using all the reports available in Analytics (Target offers a powerful but limited number of reports). When Target Standard was released, this integration became more difficult to utilize, because if you choose to use Analytics for Target (A4T) reporting, the plugins required to make it work are invalidated. Luckily, there is a way around it, and I’d like to describe it today. In order to continue to re-create the old s.tnt integration, you’ll need to use one of your three list variables. Choose the one you want, as well as the delimiter and the expiration (the s.tnt expiration was 2 weeks). The changes you need to make in Target are nearly as simple. Log into Target, go to “Setup” in the top menu and then click “Response Tokens” in the left menu. You’ll see a list of tokens, or data elements that exist within Target, that can be exposed on the page. Make sure that activity.id, experience.id, activity.name, and experience.name are all toggled on in the “Status” column. That’s it! 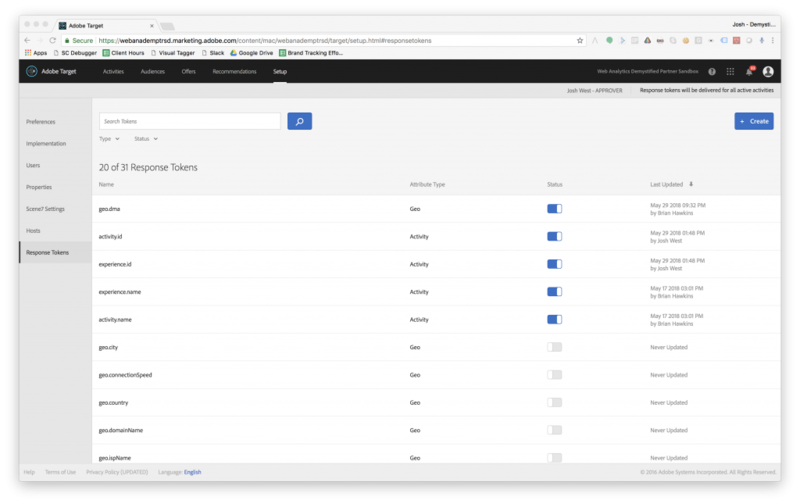 What we did in Analytics and Target made an integration possible – we now have a list variable ready to store Target experience data, and Target will now expose that data on every mbox call. Now, we need to connect the two tools and get data from Target to Analytics. So what does this code do? It starts by adding an event listener that waits for Target to send out an mbox request and get a response back. Because of what we did earlier, that response will now carry at least a few tokens. If any of those tokens indicate the visitor has been placed within an activity, it checks to make sure we haven’t already tracked that activity on the current page (to avoid inflating instances). It then adds activity and experience IDs and names to a global object called “targetExperiences,” though you could push it to your data layer or anywhere else you want. 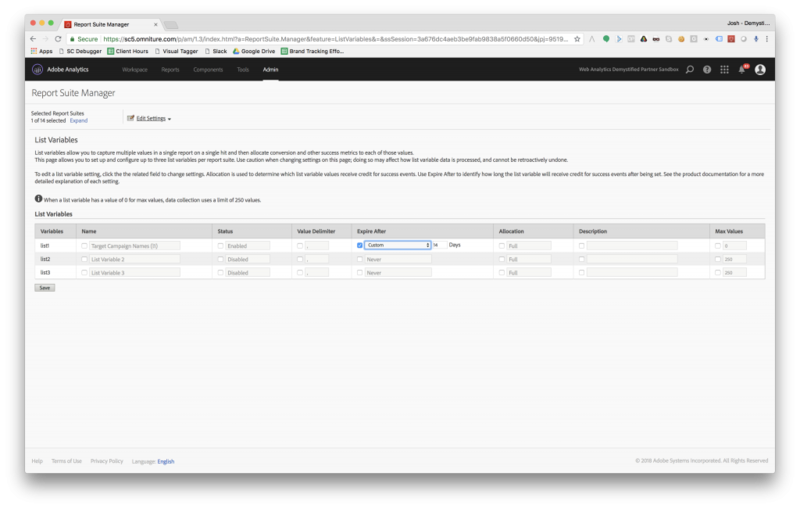 We also set a flag called “targetLoaded” to true that allows us to use logic to fire either a page tracking call or an event tracking call, and avoid inflating page view counts on the page. We also have a failsafe in place, so that if for some reason Target does not load, we can initiate some error handling and avoid delaying tracking. My code above is written in a way that allows you to track a pageview on the very first mbox load, and a custom link/event tracking call on all subsequent mbox updates. You could do this with a utag.view and utag.link call (Tealium), or trigger a Bootstrapper event with Ensighten, or a direct call rule with DTM. If you do this, you’ll need to make sure you configure the TMS to not fire the Adobe server call on DOM ready (if you’re using DTM, this is a huge pain; luckily, it’s much easier with Launch), or you’ll double-count every page. You could just configure the TMS to call a custom link call every time, which will probably increase your server calls dramatically. It may also make it difficult to analyze experiences that begin on page load. What my Launch extension does is fire one direct call rule on the first mbox call, and a different call for all subsequent mbox calls. You can then configure the Adobe Analytics tag to fire an s.t() call (pageview) for that initial direct call rule, and an s.tl() call for all others. If you’re doing this with Tealium, make sure to configure your implementation to wait for your utag.view() call rather than allowing the automatic one to track on DOM ready. This is the closest behavior to how the original Target-Analytics integration worked. I’d also recommend not limiting yourself to using response tokens in just this one way. You’ll notice that there are tokens available for geographic data (based on an IP lookup) and many other things. One interesting use case is that geographic data could be extremely useful in achieving GDPR compliance. While the old integration was simple and straightforward, and this new approach is a little more cumbersome, it’s far more powerful and gives you many more options. I’d love to hear what new ways you find to take advantage of response tokens in Adobe Target!